The tiltable steering feature is available on the premium version 5E models. The tiltable steering column provides multiple positions to adjust the steering wheel. Operators can expect sure stops when the unexpected happens in the field, on the highway, or at home with hydraulic wet-disk brakes. 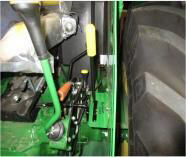 The 12F/12R PowrReverser transmission is ideal for heavy applications on 3-cylinder 5E Tractors. 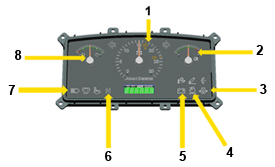 The John Deere built PowrReverser transmission provides 12 forward speeds and 12 reverse speeds (12F/12R) for operators requiring additional operating ranges, useful for field work and other applications. The PowrReverser transmission is equipped with a shiftable 540/540 Economy PTO. 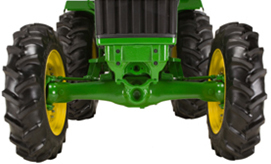 This transmission is ideal for operators using their tractors to perform in heavy applications. Maximum productivity is achieved with hydraulic power shift between forward and reverse and is ideal for loader and rear blade applications that require frequent directional switches in tight spaces. Excellent modulation allows the operator to shift the direction lever from neutral to forward or reverse, forward to reverse, reverse to forward, from forward or reverse to neutral. 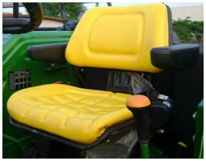 Forward-reverse shuttle at the steering column helps with changing the tractor movement direction with the help of electrohydraulic valve. Travel direction can be changed without depressing the clutch pedal. Also advantageous when turning at the headland is the ability to control the aggressiveness of the forward/reverse modulation. The operator has the flexibility to control the modulation from a slow response, as preferred in precise operations such as loading, to a fast response, as desired in applications when every minute counts (for example in harvest or seeding). The 5E engines are designed with high torque reserve of around 20-25 percent. 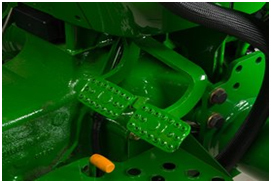 This backup torque prevents temporary overload, and frequent gear shifting during haulage and tillage applications, thus reducing operator fatigue. Platform-mounted shift levers and suspended clutch and brake pedals contribute to a clean platform design. 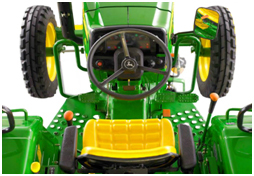 Suspended pedals also make it easier for the operator to get on and off the tractor, and make clutch operation easier on the operator when the tractor is used in applications requiring the pedals to be used frequently, such as loader work. All 5E Tractors come standard with storage locations for tools, parts, and operator's manuals. The toolbox is conveniently located on the left fender for easy access to tools and spare parts that may be needed in the field. It is made from a weather-resistant, durable plastic material. A water bottle holder is placed right below the gear shift lever on the right-hand side of the operator. Enter and exit the operator’s station with ease. To enhance access to the operator's station, left-side steps are standard equipment on all 5E Series Open Operator Station (OOS) Tractors. 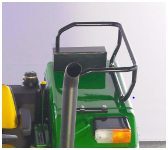 Handrails provided on either side (with heat shield and on fenders) allow 3-point comfortable contact for the operator for easy enter and exit. The MFWD centerline design provides excellent maneuverability around the worksite and more crop clearance so operators are not driving down their crops or profits. Additional versatility is proven when wheel treads are adjusted with 6 degrees of caster angle and a 55-degree turn angle, which results in a turning radius as short as 3 m (9.9 ft) when the brakes are applied, allowing plenty of horsepower to turn around in tight places. Ten degrees of axle oscillation follows uneven terrain, allowing for consistent performance and a comfortable ride. 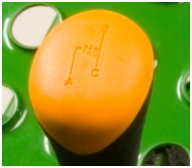 NOTE: The MFWD engagement lever is located on the left-hand side of the operator. 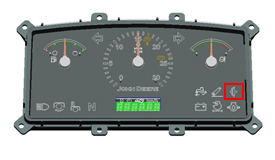 For the operator’s convenience, when MFWD is engaged, an indicator light appears on the dash. The system blinks if there is problem in the QRL system. The clutch overriding indicator results in less clutch wear, improving the clutch life. If the operator places his foot on the clutch pedal for more than 10 seconds, the clutch overriding indicator starts to blink and the buzzer starts to beep. After five beeps, the buzzer will stop. However, the indicator will still blink if the operator has not removed his foot from the clutch pedal. This avoids half-half-clutch-engaged operation due to ignorance. An innovative feature with 5E premium models is the go-home feature that enables the operator to find the way back home after dark. When pressing this button within 10 seconds before parking the tractor, the headlights remain on for 30 seconds. After 30 seconds, the headlights turn off automatically. The economy PTO provides 540 rpm to the PTO at 1705 engine rpm. The 540 economy mode is ideal for any PTO application, for running a thresher, straw reaper, and other applications where full engine horsepower is not required. For heavy-duty operations requiring maximum PTO power, the PTO shift lever is placed in the 540 position, the PTO is engaged, and the engine is run at a rated speed of 2400 rpm. This selection gives 540 rpm to the PTO shaft and delivers the fully advertised horsepower at rated engine speed. When the tractor is in economy PTO mode, the engine is electronically limited to 1705 rpm, preventing accidental over-speeding of PTO implements and protecting against binding the PTO shaft. This interlock also prevents accidental shifting of the PTO selector lever at engine speeds above 1700 rpm, which would lead to downtime for fixing implements or drivetrain components. 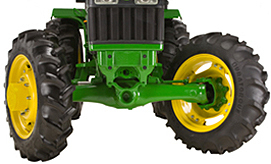 The synchromesh transmission is designed to match the excellent power and torque characteristics of John Deere PowerTech™ engines. Transmission durability is enhanced with the pressure-lubricated top shaft, allowing an operator to achieve performance from one working season to the next. This technology equalizes the speed of gears, thus allowing smooth coupling. 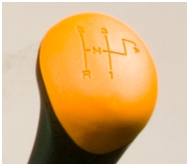 The layout of the gear lever has two forward and reverse gears on the top of the lever, making the operation easy for commercial applications like loaders and dozers. 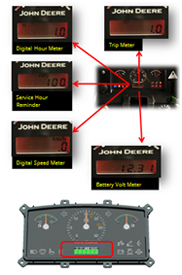 Operators can easily switch directions without having to completely stop the tractor with top-shaft synchronizer (TSS). A positive park pawl on the transmission provides positive park and eliminates the need for a hand brake. This mechanism is built into the transmission for positive gear locking. 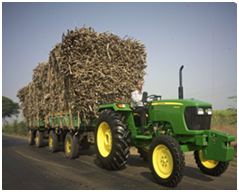 Even if there is a failure in the braking system, one is safe from accidental tractor movement. This also eliminates clutch service costs that occur when the park brake is accidentally left engaged.